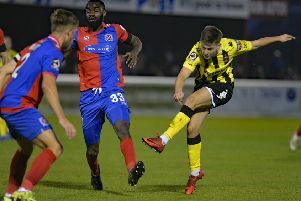 Coasters midfielder star Sam Finley admits the weekend’s abandoned match against Maidstone United was frustrating on both a collective and personal level. The National League fixture was cut short three minutes after half-time by referee Marc Edwards because of horrendous weather conditions with the Coasters leading the game. Finley had put the hosts ahead with a fine strike before Joe Pigott levelled. Jack Muldoon ensured the Coasters went into the break in control, turning home Danny Rowe’s drive. However that was to be the last of the action as the weather failed to ease. Finley, captain on the day, could not hide his disappointment after his goal, and a potential three points, were chalked off. “I was disappointed because I thought we battled well first half,” he explained after the encounter ground to a halt. “We had an advantage with the wind behind us, even though they won the toss, I’m not sure why, but it was going for us early on. “We wanted to get onto the front foot and the conditions almost worked in our favour and I thought we did well. “We have been playing a new system recently and I though we got it out to the wing backs very well. Burky (Luke Burke) did particularly well down the right in the first half. “I really enjoyed the goal. I’d had a effort a few minutes earlier that I thought was flying in but their defender got a good block in. “For the goal their lad slid in and I managed to get my foot in front of it, put it onto my right foot and fire it in to the bottom corner. Fylde are straight back at it tonight against Wrexham and the 25-year-old will renew acquaintances after enjoying a stint on loan with the Welsh outfit in 2015. “It should be interesting,” said Finley, who reached the FA Trophy final with the Dragons during his loan spell. “We have a decent idea of how each other plays now with it being so soon since the last game. Fylde saw off tonight’s National League rivals in the FA Cup just 10 days ago to earn a first round meeting with old foes Kidderminster Harriers. Finley isn’t sure what kind of test they will face from the National League North side. He said: “We had two really good games against Kidderminster last year. “We got promotion in the end and they were beaten in the play-offs so I’m sure they will be up for it. “I have to admit I haven’t kept tabs on them this season and the players they have signed. “Obviously Dan Bradley has gone there and three of their lads came here, but I’m not quite sure what to expect of them just yet.